It’s hard to define my style. I like a mix of so many different things, as well as a sprinkle of salvaged / vintage architecture for good measure. So I’m going to name this room the salvaged farmhouse bathroom makeover. There aren’t many rooms in my home that I adore. So when I set out to pretty up this bathroom, I made sure every element was something that truly spoke to me. While utilizing a brand new modern vanity from VirtuUSA. I’m not a pro builder. I have ideas, but I don’t yet have the experience to build something amazingly professional. So when the opportunity came to recreate a bathroom I loved, the new vanity did it for me. It was the push I needed. Most of us have access to prebuilt vanities. So what better way to get a pro build, teamed up with a little funky junk flair? But the bathroom challenge became so much more than that. It was about creating features that until now, only lived in my head and my heart. I grew up in a farmhouse, and I miss the architecture and character. So I decided to see if I could emulate that myself, starting with this one room. 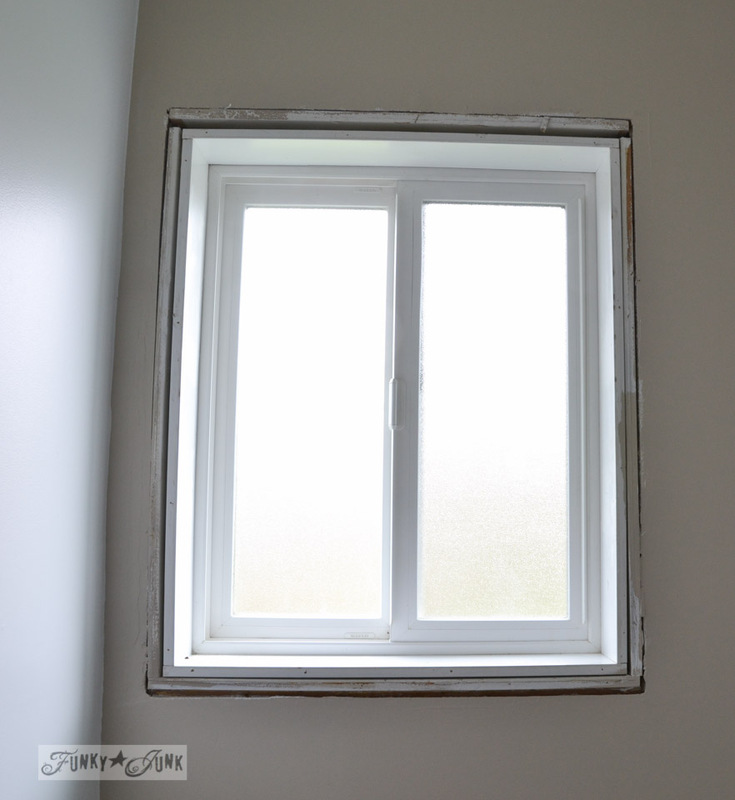 I learned how to frame a window with fabulous farmhouse vintage style, with NO miter cuts. The room style changed immediately! And I knew what had to come next. I learned how to plank my own ceiling! And what a perfect room for me to give it a whirl! I’m so happy with how it turned out! I used pine tongue and groove boards, nailed right over the popcorn ceiling. Crown molding is pine 1 x 4s. 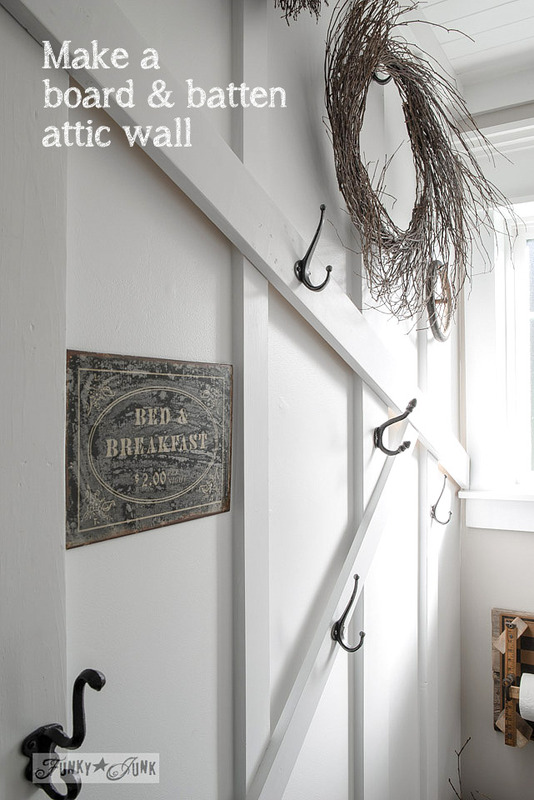 And that’s when a ‘farmhouse attic wall’ became the next brainstorm. 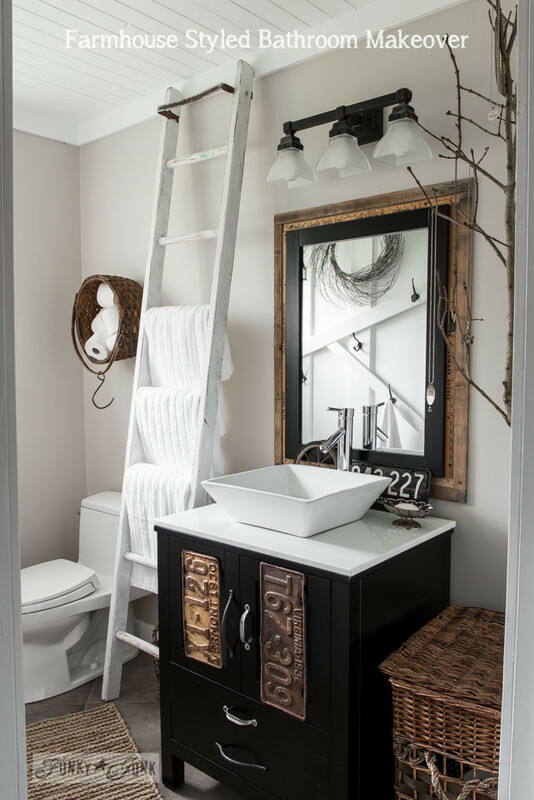 The floor to ceiling wall solved the lack of towel space we had previously, plus gave the entire room the feel of stepping into a bright and cozy attic styled bathroom. The wall was covered in random sized boards from floor to ceiling, nailed in place, then cross bars were attached, offering a unique design and stability for the hooks. 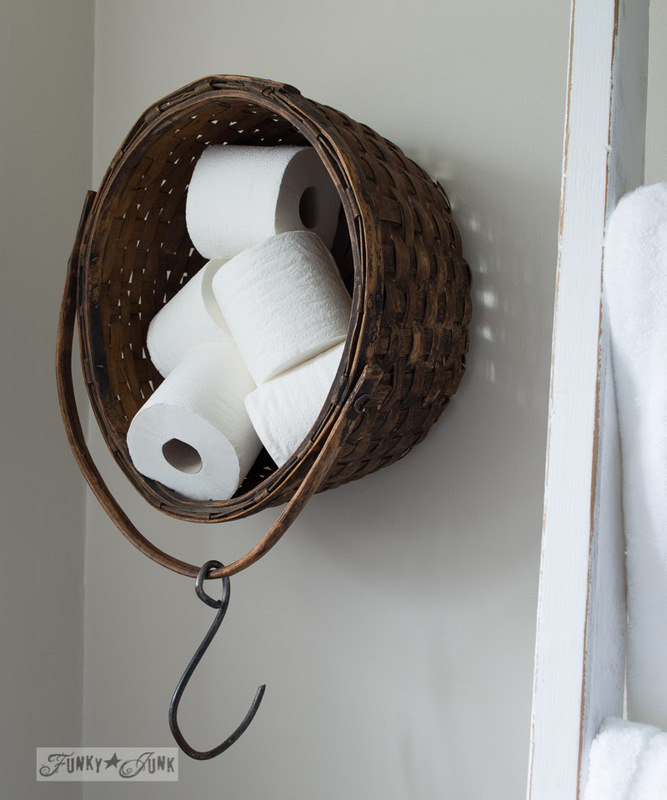 A rustic basket (from my junker brother’s garage sale) on it’s side stores bathroom essentials in a tumbling down style. 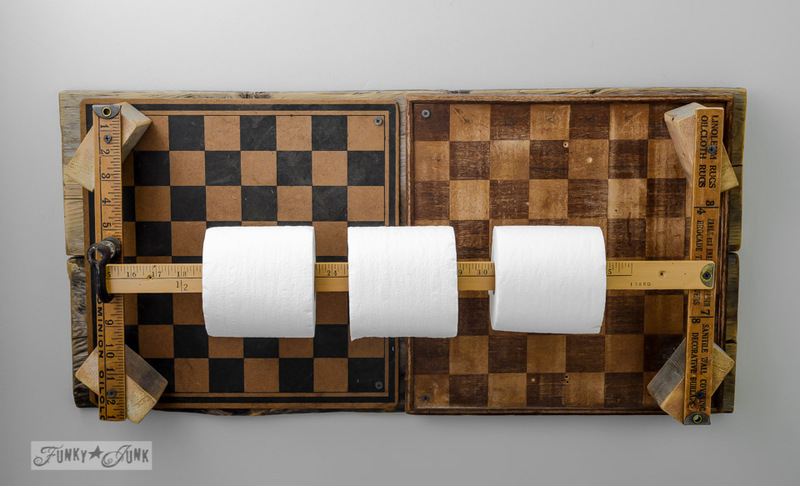 The toilet paper holder is actually created from a checkerboard tray I previously made. I added an extra yardstick to hold the paper, with a hinge of sorts. The link above shows you the steps. 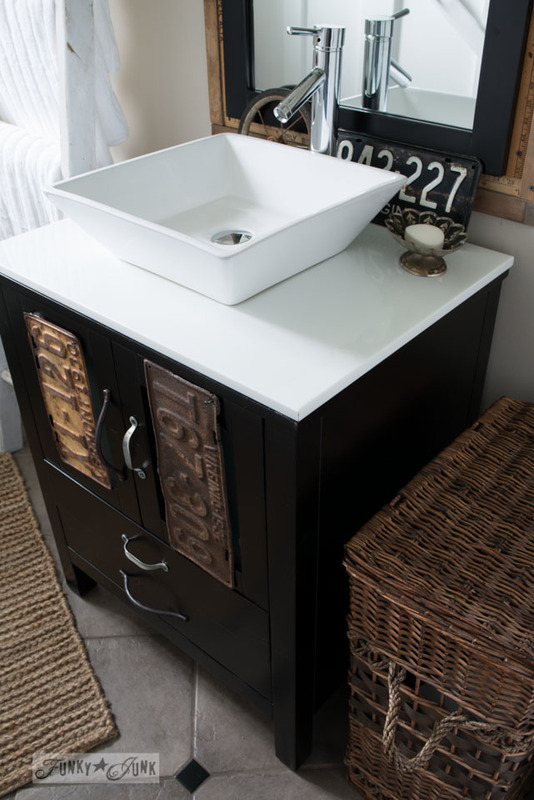 The vanity I chose from Virtu USA is AMAZING. It’s called a Brentwood single sink 28″ vanity, which came with a countertop, vessel sink, sleek chrome faucet, base, and mirror. Totally complete. And the quality is beautiful. The doors and drawers are self closing so it’s whisper quiet! I have always wanted a vessel sink and now I have one! And as you can see, I added eclectic hardware, license plate bling and framed out the mirror. I’m so in love with it and it’s the perfect size for the room! 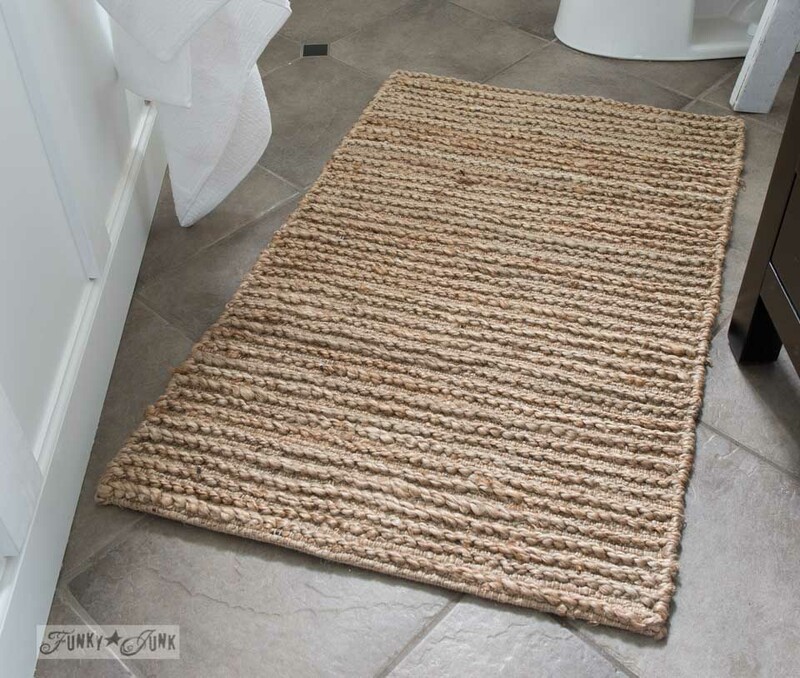 I even managed to find a sisal styled rug to chime in with all the wicker in the room. Working with Virtu USA was truly a little dream come true for me. Not only was I able to create the bathroom of my dreams, my contact Hung was amazing to work with. He was professional, personable, and made sure every i was dotted and t crossed. They are truly king in customer service. The vanity arrived so well wrapped with everything intact. It was such a pleasure to be a part of this event. Wood boards / Allenby’s in Yarrow, BC Canada. All else from thrift stores and various antique shopping areas. And some exciting news! 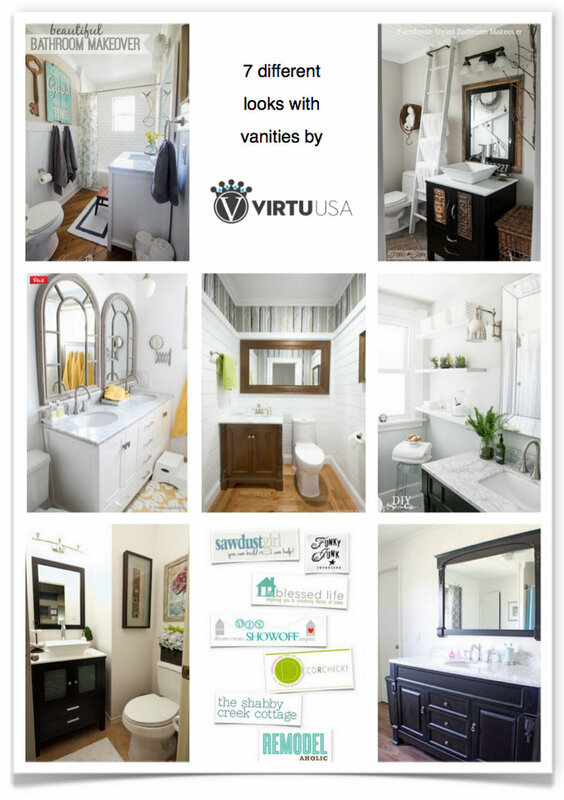 Visit even MORE VirtuUSA bathroom makeovers below! Disclosure / I have partnered with VirtuUSA for this event. But as always, my opinions are my own. I’m so happy with their product and amazing customer service! That looks great – I don’t think my husband would ever go for something like that though. Some neat ideas and great creativity. OMG!! I am so going to use some of your ideas. I love love love the wall!!! How lovely! I love the mix of old and new. I have the perfect old farmhouse bathroom to do over like this! Now, to convince the other half!! The vanity is wonderful, and I like it all came as one! 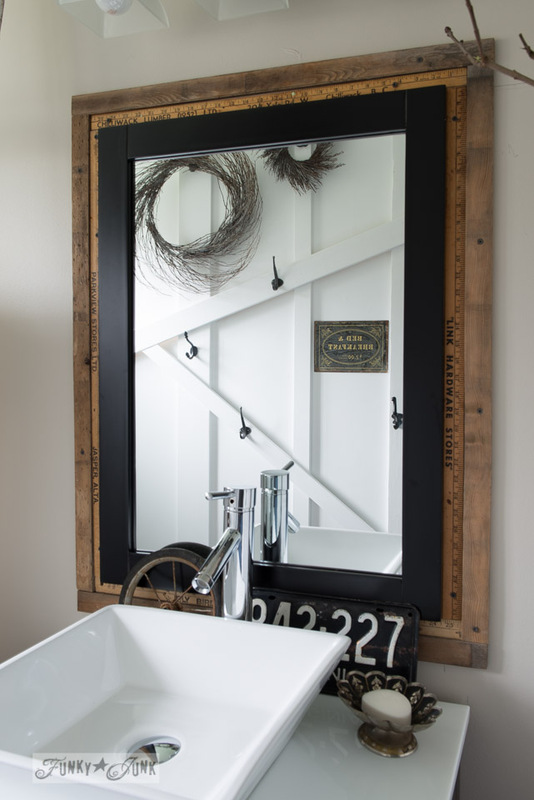 My daughter and her husband are needing a smaller vanity..I shall have to check this out! Thanks Colleen! The vanities are sold EVERYWHERE. VirtuUSA specifically deals with wholesale. You can find them in any big box store and beyond. I just love their attention to detail. 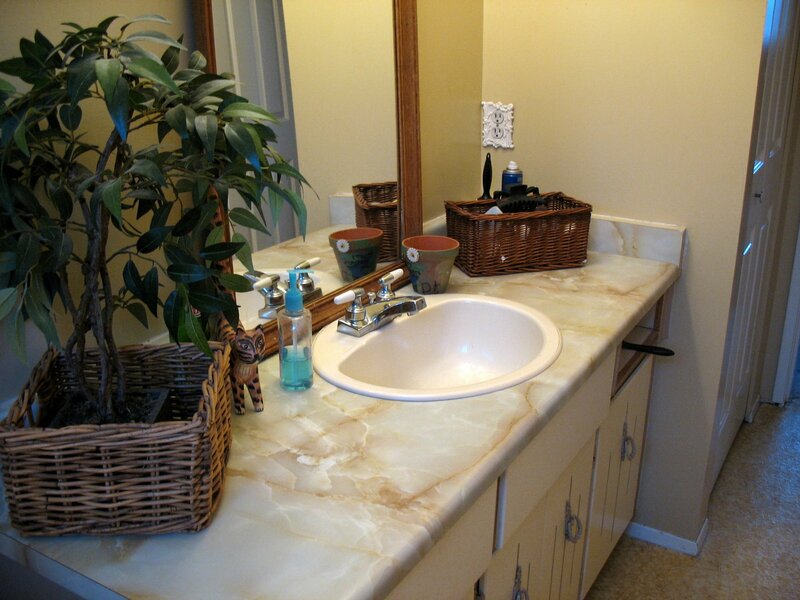 Your bathroom turned out amazing! So many people have been saying lately that they don’t really know what category their style falls in. Salvaged farmhouse works perfectly! Thanks Lisa! Ha! I thought up that reference in the wee hours of the AM. I think I’ll hang onto it! 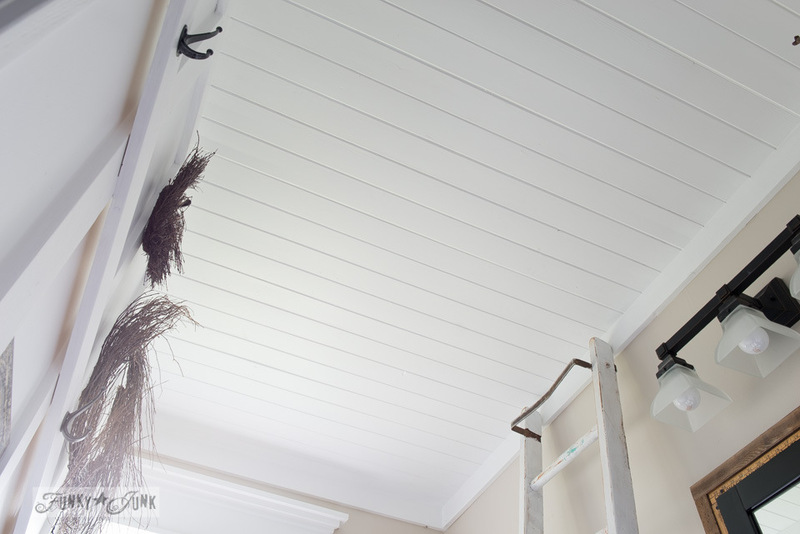 Fantastic redo….love everything about this, it was nice before but the trim and ceiling take it to a while new level with all your details….wow. I can’t wait for the plank ceiling tutorial. :). Thanks Corry! 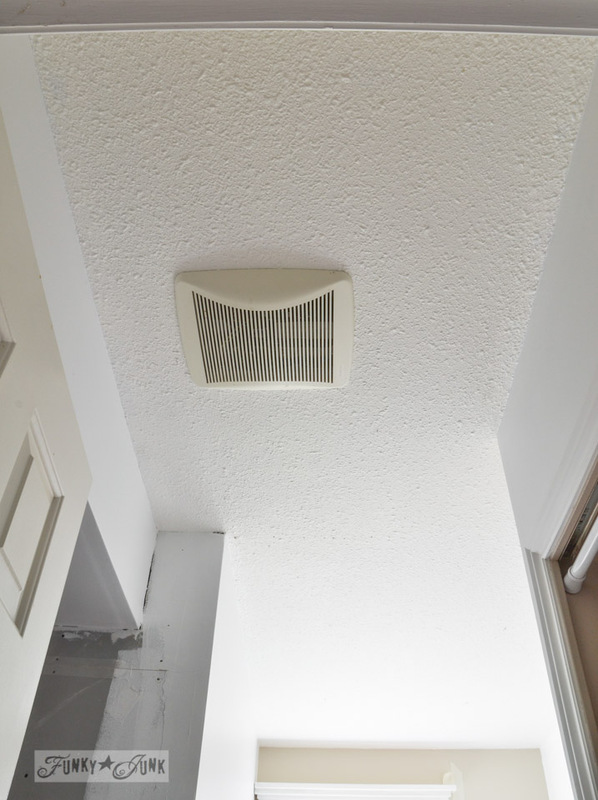 I didn’t dislike the before, but I always felt a need to ditch the sea of drywall for something else. The ceiling took effort, but the wall was so easy. Still, all well worth it. There is a lot to love in this bathroom, I’m going to pin all sorts of parts to my various boards, but what is throwing me over the edge of delight is the toilet paper holder. I love it! LOL Bliss! Coming up with something for the toilet paper holder was tricky. I had to cover the existing hole in the wall as well as centre it under the window if possible. This actually works very well! I’ll try and take better pictures of it and add it to this post. It’s perfect and I love it !! 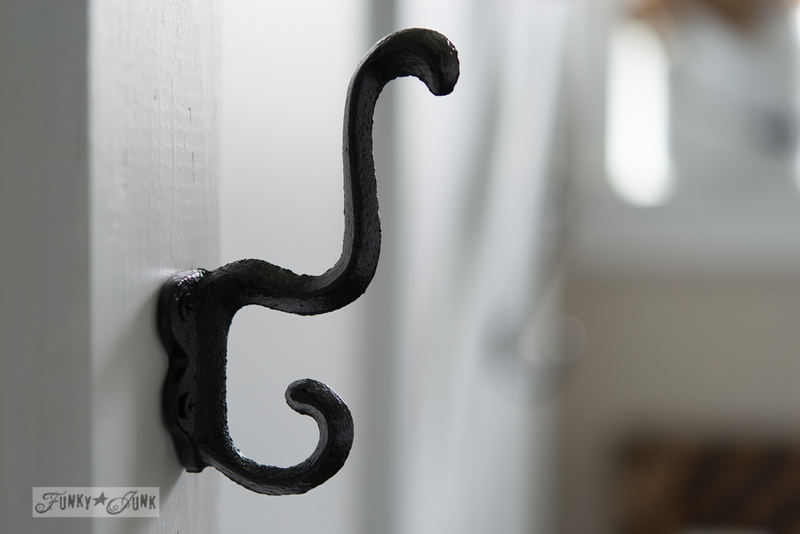 I am going to steal a few things to use in my kitchen redo!! 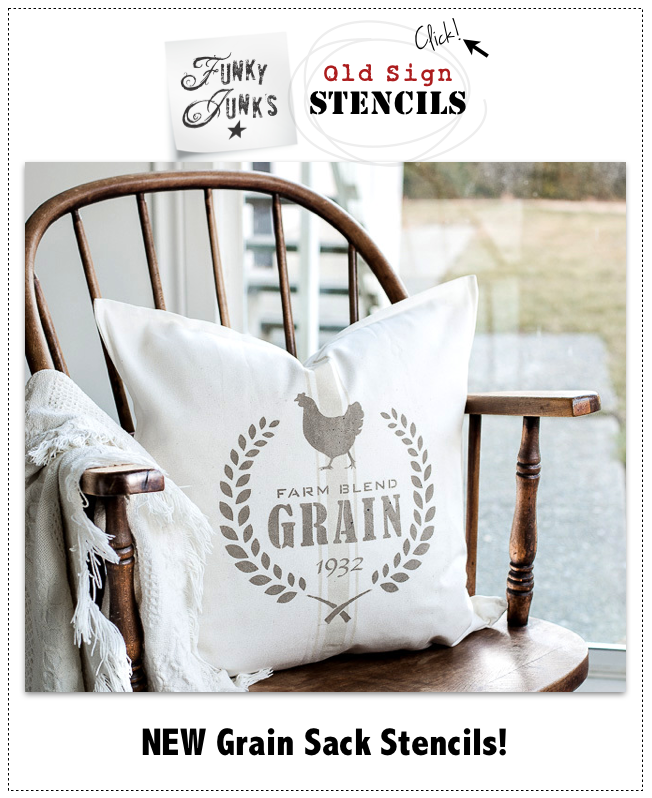 I love vintage and farmhouse!! Thanks Christy, I really did. I wanted to love everything this round and worked it! There are some areas I avoided taking pics of because I didn’t reach that point of love yet. I’d love to do something creative with the door as well as shower surround and linen closet. Coming soon! You did an amazing job – I love everything. What a great bathroom! You always have such great ideas! Realllly cool bathroom! And that’s not something you can say about every bathroom! Donna, this bathroom looks amazing! 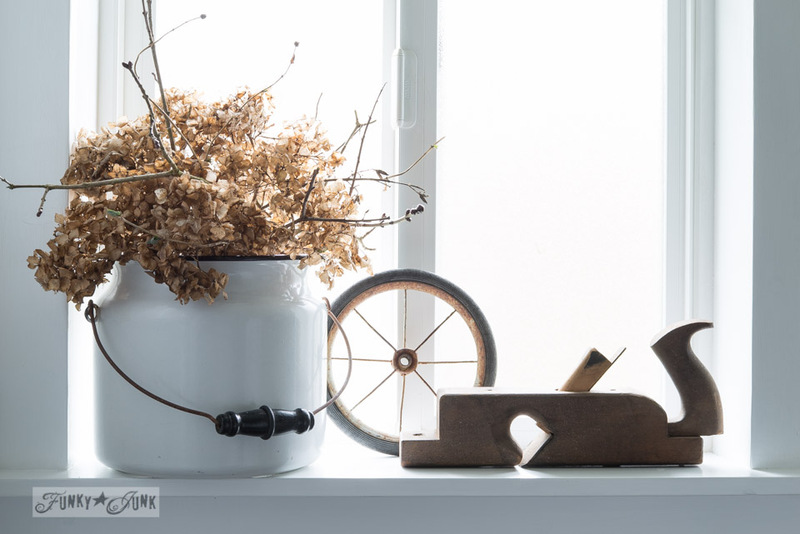 I love the farmhouse look you have created from the window framing to the ceiling and wall. The vanity set is beautiful. I liked your funky bathroom before but this new look is really beautiful. Great job!! Thanks Pamela! I fell in love with that little vanity right from the get go. The boxy lines allowed you to cover it with other things so easily. It was fun to play! This is amazing……..looks awesome……you have done a great job. Donna – wow! Just beautiful and I love all the added personal touches. You are very talented indeed! Drool worthy, every little bit of it! Nicely done! Huge high 5!!! You go girl! Love it. You should have your own magazine. Donna, what you did with the window, walls and ceiling is just amazing. You are a professional! Love all the details too like the license plates, gameboards and yardsticks! The bathroom looks awesome. I love your touches of rusty old things! I can see all the pics now!!! Oh thank goodness… not a good day for things to go wrong! 🙂 Thank-you Judi! You always amaze me! Love, love, love the planked ceiling but the attic wall is so cool! Not sure where you come up with all of your wonderful ideas, lady! Super job on this bathroom. It looks amazing! Thanks Denise! The wall came to me while I was sitting on the floor staring at it wishing I could do something different than just board and batten and didn’t want to plank as I had already planked the ceiling. I nearly used reclaimed wood for the angle brace, but then felt it was too much competition for the other side of the room, so left things white. I really want to do this in other parts of the house now too! Haha! Thanks Tina! I’m actually loving the modern lines against all the old. It’s an extra unexpected quirk in my book! I popped over from SDG and I have to say again (from last visit here) you have such a GIFT for styling JUNK into the COOLEST items, decor, and style. I would never say I personally love “junk” but I love your style!!!! I don’t think anyone could match your talent in this area–pure perfection. And I LOVE your window redo. 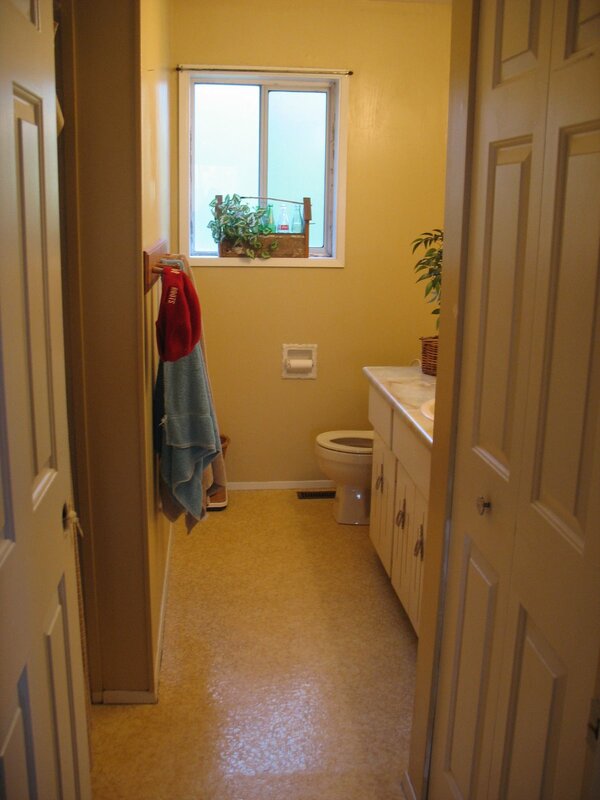 I really love so much about the whole darned bathroom! Please come to my home and make over our bathrooms. We have three of them, so there’s lots of space for you to work your magic! 🙂 Seriously, I love your bathroom – actually loved it before (mid-makeover?) – and now it is amazing! The vanity is so pretty and I loved how you truly made it your own! This is a jaw-dropping makeover! Girl, you outdid yourself this time! I love everything, but I’m quite fond of the free item in the room…. the tree branch. It’s definitely something I would decorate with, but many people might be apprehensive about the quirk. Love it! p.s. That’s my birth year too! You’ve done it again Donna! So fresh and lovely. So much eye candy! And always so functional and beautiful! Thanks for sharing! Hi Jamie! I truly don’t remember, it was probably a garage sale or salvaged store find. As with most of my junk things. 🙂 Thanks for the kudos! I can honestly say this is the only other bathroom I have seen pictures of, besides one that Bliss Ranch has shown, that I have wanted to come visit and see in person. 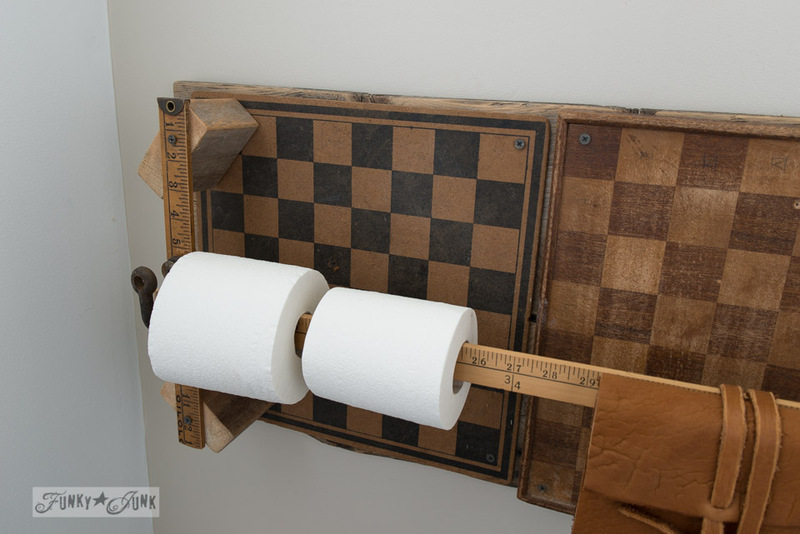 I love every detail of this room, but I think my favorite has to be the yardstick/checker board TP holder!!!!! I am sharing that on my FB page. That is so far out of the box, it is in it’s own junking universe. Aww Karen, you made me smile ear to ear! Thanks for the share! So appreciated! You can’t see me but I’m giving you a standing ovation!!!! Bravo Donna! It’s gorgeous, love everything about it. You’ve outdone yourself again. Getting ready to plank the ceilings in several rooms, will your tutorial be out soon? Should I wait or plunge in head first? Seriously, I’ll explain my pitfalls to save you a little heartache. Soon!! Thanks for the kudos! This is truly an amazing makeover. I love everything about it. Your special touches make it so unique and pretty! 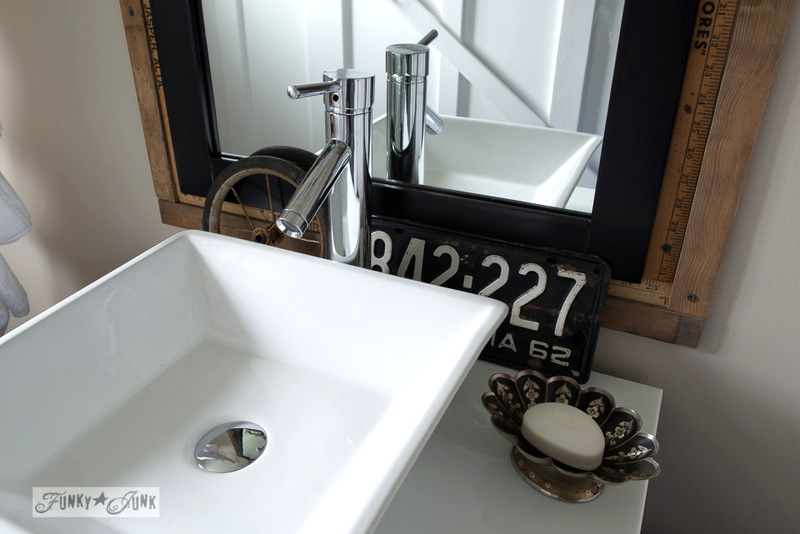 I am so drooling over that vanity and vessel sink! Without a doubt the best reno-redo of a bath I’ve ever seen. I live in an apartment so a complete redo is out of the question, but the accessory tree, OMG. 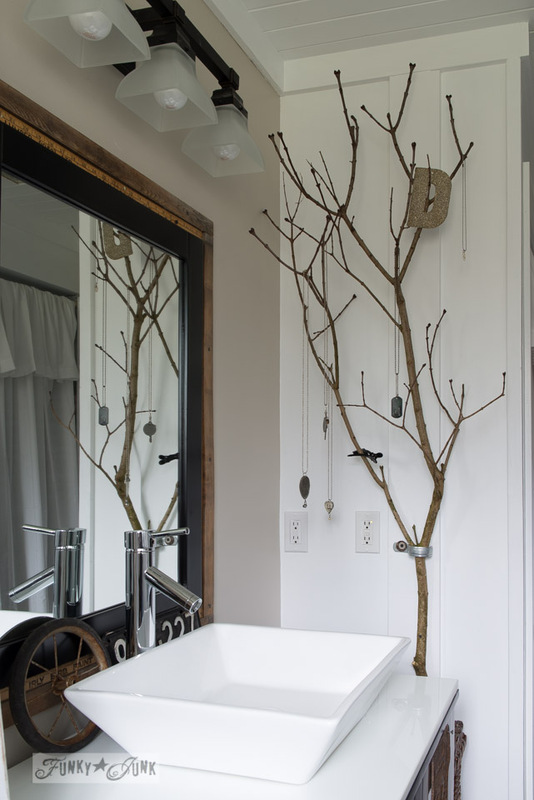 This I can do and have the perfect branches to make something truly unique for my bathroom. You may not consider yourself a professional, but you certainly have grown greatly with this experience and I appreciate your share. Thanks. Oh my… thanks so much! Yes, the branch anyone can do in minutes! Have fun!! It looks seriously absolutely amazing Donna- I love how everything has come together. That planked ceiling is incredible- I would love to do that in every room in our house (I hate our textured ceilings). But I think the most interesting thing in the whole room (which is a tough pick because the whole space is so interesting) just might be that branch necklace holder. Wow. I have some serious pinning to do. Amazing. Beautiful Donna–truly amazing. I love the ceiling and the license plates on the door. You rock girl! 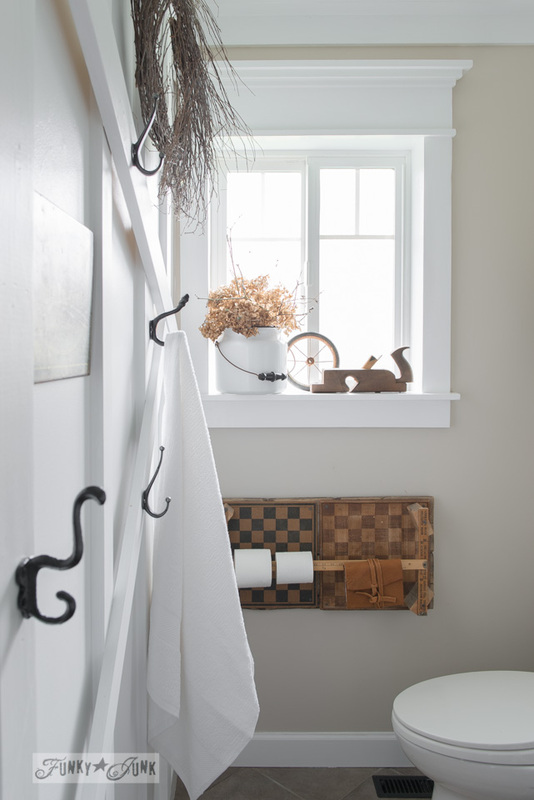 Your bathroom is gorgeous I love the wall with the hooks! Awesome… We need our tiny bathroom redone and you’re making me think we can do it ourselves! Stunning transformation. When I grow up I want to be like you! Your photography is just beautiful as always. THis is funking junking awesome Donna !!! OMG – you just amaze and inspire me to no end – this should be in a magazine – truly outstanding work! 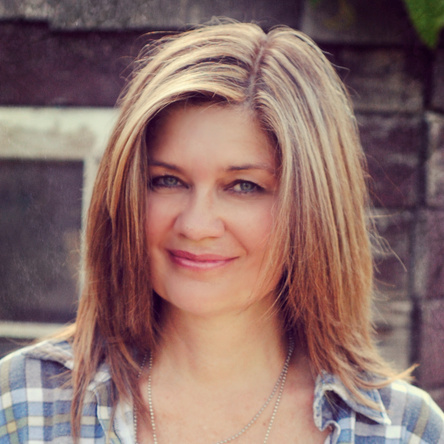 Donna – you ROCK! This is just fabulous. You are one talented lady. I’ve asked before and will again – you wanna come to Virginia? Of course, I love love love everything but love seeing the VA license plate! So, I’m sitting here looking at your post with my boyfriend. He’s awe struck and said we need to hire you when we buy a house. You are amazing, dearest Donna! I love every singe incredible detail. Really enjoyed this one. I love it. 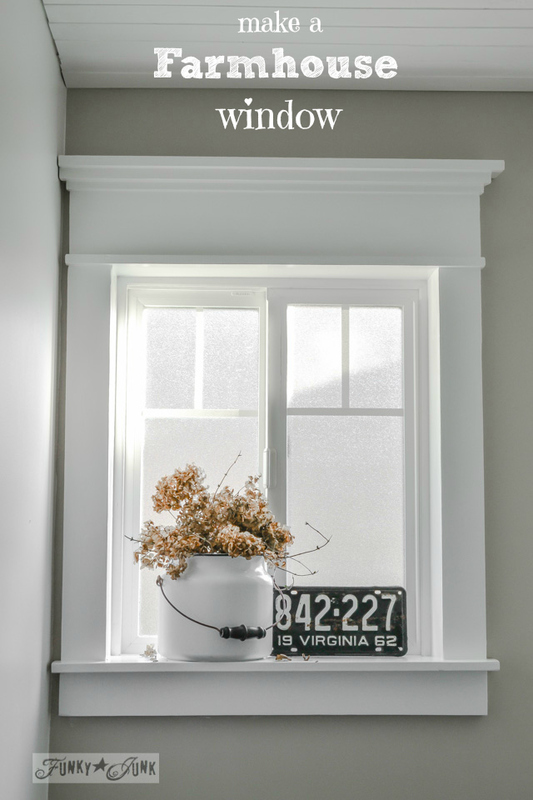 I love the chucky window trim and that WALL! Pat yourself on the back for me…you did a wonderful job on this. You did such an amazing job, Donna! The window turned out gorgeous and I love all your fabulous junk creations. 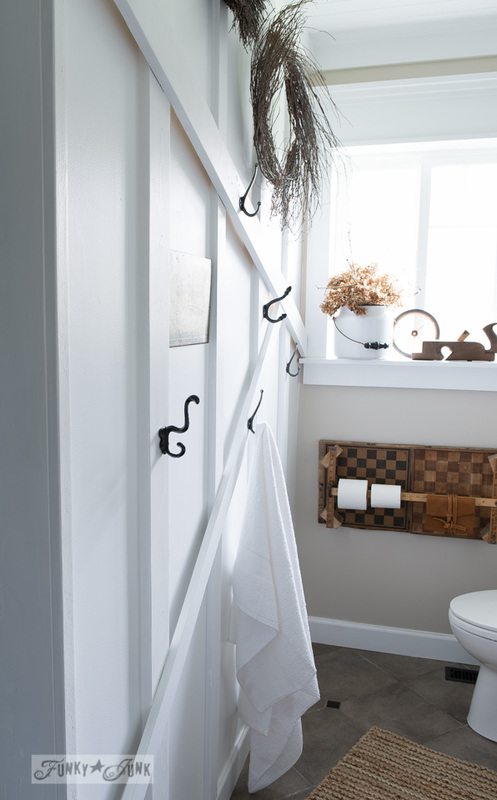 The yardstick mirror is beautiful and you came up with another great idea how to store toilet paper. Very cool! Enjoy your new bathroom! I just love the bathroom. I really like the use of the yard sticks, checker boards and the ladder. What great vision you have. Thank you for sharing. I love your bathroom and was wondering if you hire out. lol Really it is beautiful and you did a great job. It’s beautiful, Donna…truly beautiful…and you should be VERY proud because you got up the gumption and did it all by yourself! This is the sort of bathroom where your guests get sitting on the throne and take two hours to come out. Perhaps that may be what the journal is for? 🙂 I love all of the elements you created; it’s impossible for me to choose a favourite. 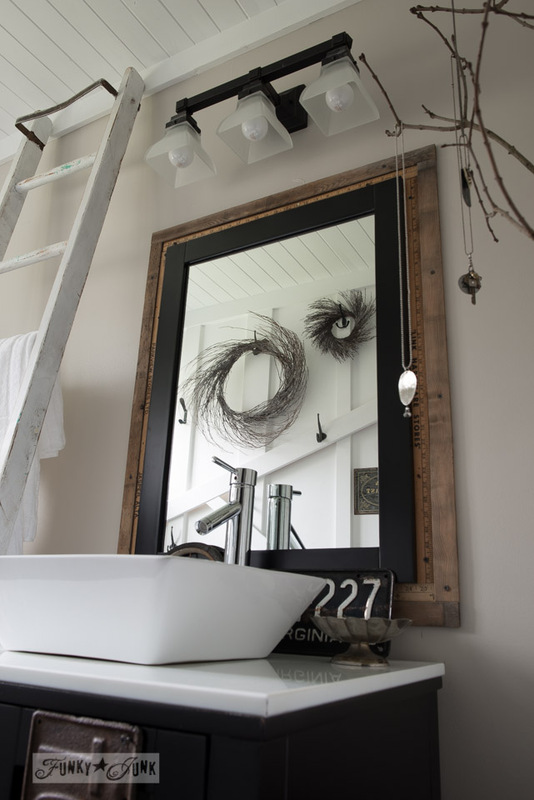 From the beautiful window you framed out, the stunning attic wall, the way you made that gorgeous new vanity your own, the lovely planked ceilings, to the genius toilet paper holder…it’s all just sooooooo amazing, sooooooooo inspirational, and sooooooooo YOU! Thank you for sharing all of your hard work with us and for giving us the encouragement to get cracking on our own dream projects; you are a treasure and I completely agree with what another poster wrote; you should have your own magazine or TV show plus a line of products of your own! Oh, this is so beautiful! I love the white with all of the natural elements. It is so inviting (and inspiring). You created a wonderful, cozy room. Thank you for sharing it with us. It looks soooo good! Love everything about it! 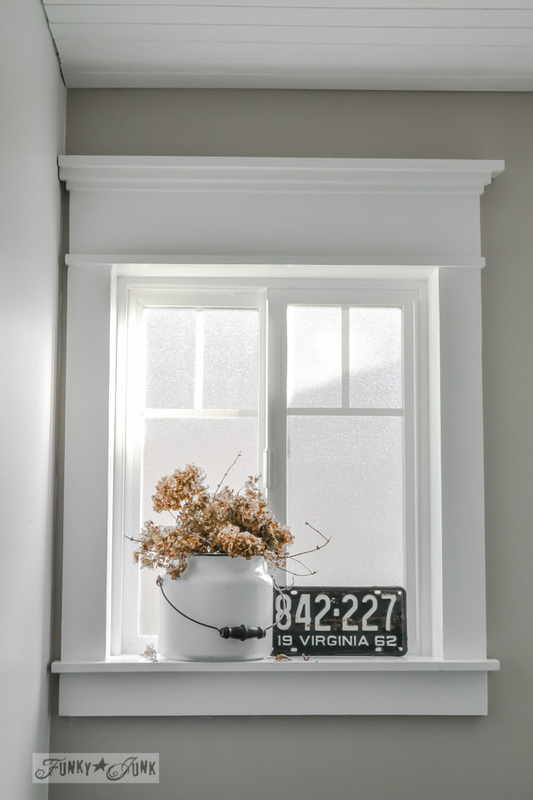 When you install your crown moulding, do you use 1×4’s? Do you miter the corners or just bump the ends up against each other? Thinking about trying this and just want to see how complicated it is. Thanks! Oh Donna, There is so much that I love about this room, you did a fabulous job! You’ve given me so many ideas; that basket for the toilet paper, the wall of hooks, the framed out window, the planked ceiling. I could go on! I just love it all! I love it. 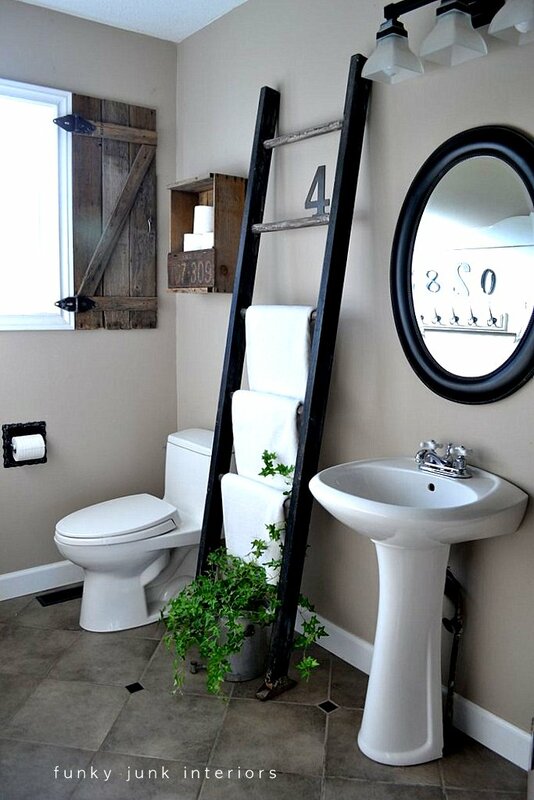 I was thinking I really like the shutter, toilet paper holder, ladder and the oval mirror. Why change? Then your completed project was completed and OMG. I wished I lived close to you so you could teach me how to do that ceiling. What happens when you take items away from other projects – The basket was with the fireplace and the white ladder was in your bedroom? Thanks Billie! And LOL to your question… oh my goodness… my home never stays the same for long. When I pull something out of one room and put it into another, I have to start all over in the other room. But there’s so much good that comes out of it. It keeps things from getting stale and boring, plus gives me more reasons to try new things and keep creating. Shopping your own home truly has some great perks! All I can say is, amazing…I keep scrolling back and forth looking at all the ever so creativ details!…Just beautiful! Oh my goodness, Donna! So many lovely & funky things to look at! I love the old reclaimed items against the crisp white background. It’s truly a beautiful room. Congratulations! Donna The bathroom is GREAT!!!!! I am so glad I found your blog. Your bathroom looks awesome and perfectly farmhouse. Love the ladder too. I need to find one. My favorite part is the ceiling! Can’t wait for that tutorial! I literally pinned every single picture on my Dream Bath Board. Love, love, love every single bit. It´s just like Mary Poppins opened here big miracle bag, and out came the most gorgeous quirky and edgy bathroom. If I could afford it, I would sponsor you a flight to Germany to replicate this one in my house. SO many things to love, Donna! 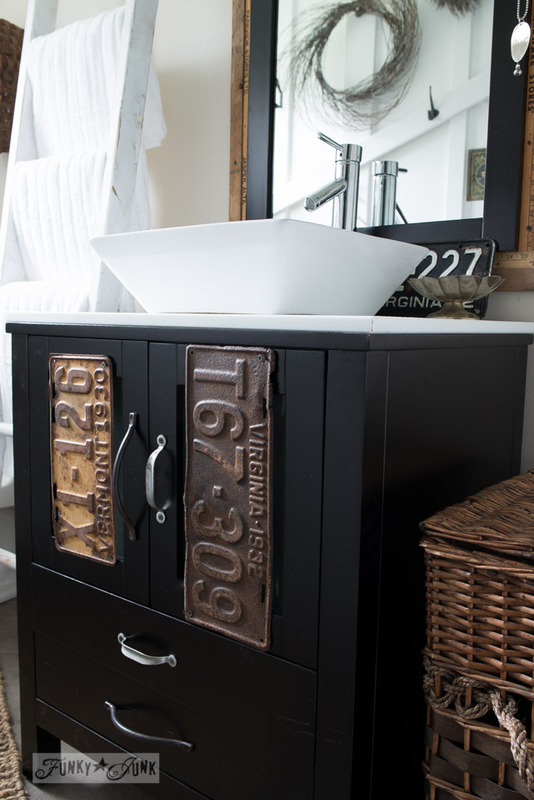 I especially love the wall, but the way you “funky junked” the vanity cabinet is pretty awesome, too. Lots of great stuff, well done! Beautiful! I love how you mix the new with the junky flair! The window is beautiful, kudos for figuring out how to do it & actually doing it! The checkers/chess board is really clever! Thumbs up to you girl. Love it, Great job. Awesome as always Donna! Your creativity never ceases to amaze me! Incredibly creative. I love all of the new uses for old things. Beautiful transformation! Wow….. 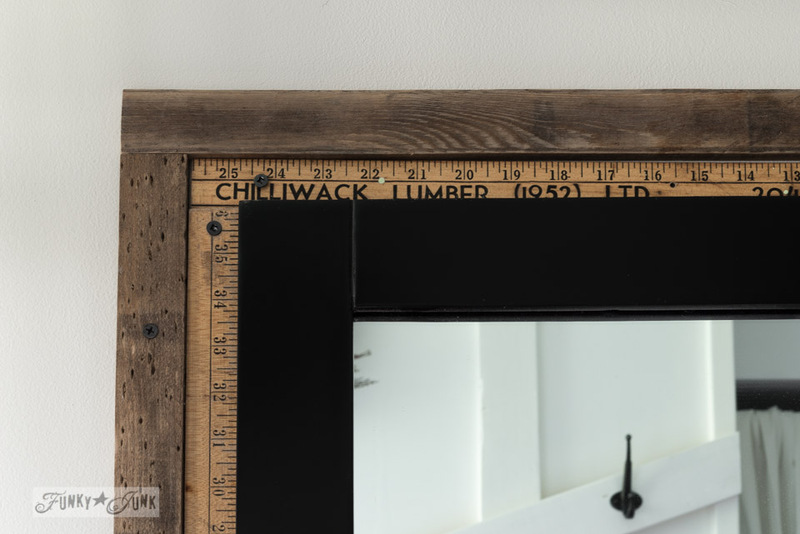 I am amazed to see the yardstick at the top of the mirror say Chilliwack Lumber. I live in Chilliwack BC Canada.. and wonder if that stick came from around this area?. Chilliwack is not a popular name, so makes me wonder where that stick came from. p.s. — Love everything about the bathroom !! This is fantastic and such a wonderful transformation. You made such good use out of items you had, which is my favorite thing to do! 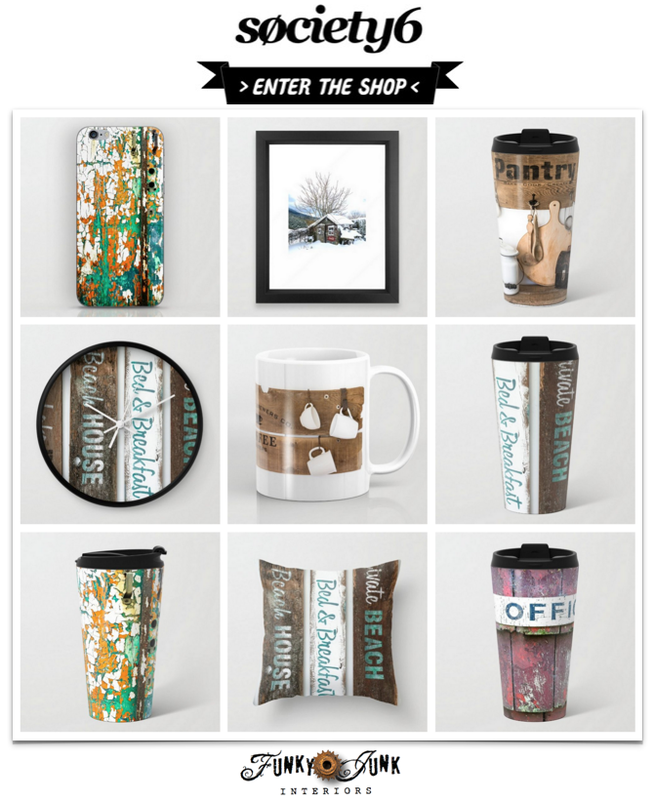 You are so talented… I am pinning and sharing on Google+ …GORGEOUS! I can tell that it gives you great joy and it’s given me great inspiration! room with character and charm. I am building a tiny house on a trailer. I typed in farmhouse window. Your site came up and I love what you have done. I have all the power tools needed. So, I will head outside and cut my pieces. Ohhh Irene, yours will turn out even better with your expertise! I’ve since done a doorway with this treatment, and by far, the quality really ramped up using pre primed boards. All the best! Your style is certainly unique, but I absolutely love it! Your bathroom looks a million bucks! Oh my word…I so get your style!